Accurate oven temperature is essential when baking bread, cakes or cookies. If your oven is set too low or does not heat to the correct temperature, it can alter the cooking time, texture and color of your cakes and other baked goods. Although an oven thermometer should prevent a too-cool oven, not all oven thermometers are accurate. Knowing the signs of an underheated oven can help you adjust it and prevent this problem in the future. If your oven is not hot enough, cakes or cookies may fall as they cool. You can disguise a fallen cake with fresh fruit, frosting, or whipped cream. In other cases, the cake or quick bread may be undercooked in the center, resulting in a sunken and wet center. If the center of your cake isn't cooked through, discard the cake or serve only pieces from the outer edges and discard the undercooked center. Dry cakes, cookies or loaves of bread may be the result of having baked too long in a too-cool oven. 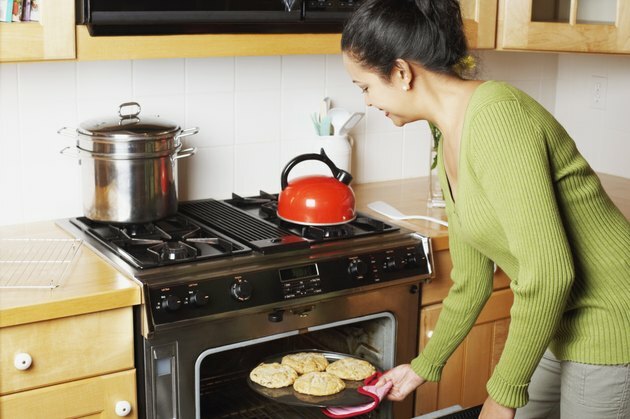 If your baked goods are consistently dry, check your oven temperature. Overly dry baked goods can also result from incorrect measurements or a poorly designed recipe with too much flour, leavening or shortening. Too little sugar can also cause your baked goods to be dry. Coarse and grainy breads, cookies or cakes frequently result from an inadequately heated oven. Improper or inadequate mixing, the use of liquid fat in place of solid, and excess leavening may also result in coarse, gritty or grainy baking. If your cake or bread comes from the oven feeling more like a brick than dessert, you should check your oven temperature. Breads require adequate heat to rise properly. If your oven is too low, the bread will not rise enough, producing a heavy and unappealing loaf. Improper mixing or recipe ratios may also cause your bread or cake to be quite dense. A cool oven usually produces a pale or soft crust or inadequate browning. Increasing your oven temperature can create a darker crust, but you may also need more sugar, leavening or shortening in your recipe.